If our North-South high speed (or, better still, sub high speed) rail scheme were built North-first, with a fast crossrail between Manchester Victoria (that’s next door to the Arndale Centre) and Leeds, following the M62 eastwards from Rochdale, it would halve the rail travel times between the two cities and alter the whole shape of the HS2 project. HS2 Plan B would have no London-first start from Euston, no route straight to Brum (to Brum’s disadvantage), no route across Cheshire to Manchester Piccadilly, but Plan B would have a station at East Midlands Airport and it would extend north to Leeds-Bradford Airport, Harrogate and the Tyne through a new Bradford Central station. It’s worth remembering that Bradford Central would still be only half way between St Pancras and Edinburgh. 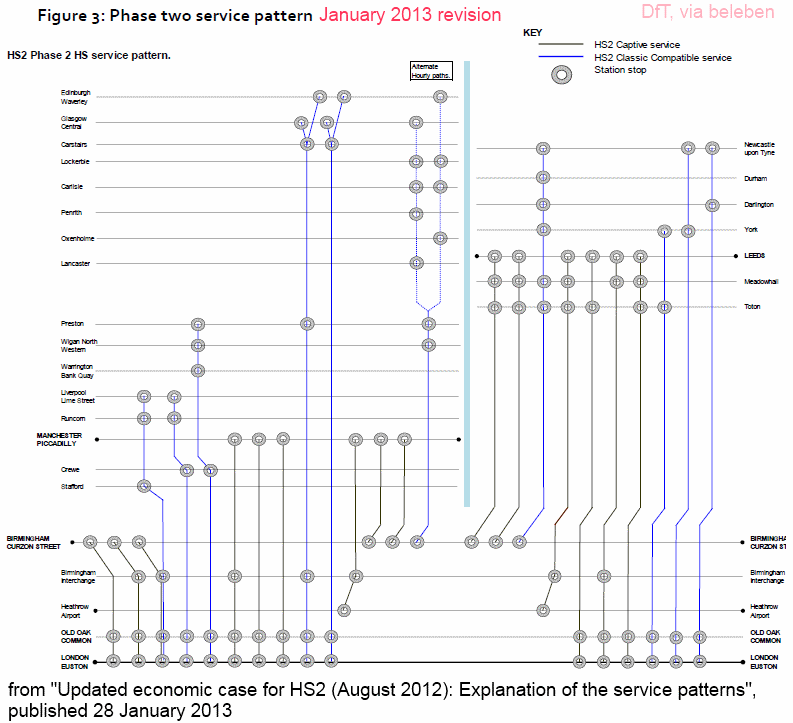 In your ‘HS2 Plan B‘, and its earlier version, it’s unclear as to where trains would stop and what the service pattern would be. The only stations marked seem to be at airports. As I see it, the fundamental problem with ‘Build-first-in-the-North’ and ‘Link-up-airports’ concepts, is the insufficiency of demand. Thank you for reading the link! destinations, but with scope for interchange stops or collector chords for (coming south) Rochdale, at M62 Jn.24 (Huddersfield/Halifax), at Mirfield station (Huddersfield/Dewsbury), at M1 Jn.37/rail-rail (Barnsley), at Meadowhall (Sheffield/Rotherham), northbound into Sheffield/Rotherham, at East Midlands Airport (Derby/Nottingham) and at M1 Jn.13 rail-rail (Milton Keynes East/Bedford). Likewise a Coventry NE/rail-rail interchange next the M6. A shortcoming of Plan B’s North-first start is that the wider North would grow into its capacity and time gains slowly, but with these tending to unravel once the route reached St Pancras and London’s magnetism reached north more easily. The early creation of more economic critical mass around the four cities involved (as proposed in the immediate catchment of Manchester Airport, ditto East Midlands Airport) would offset this, but your ‘risk of a fare-box deficit’ critique is fair. The related problem with HS2 itself is that it would unravel its eventual economic gains to the North before it actually got there – and it would leave undone Plan B’s big step-change: a fast east-west rail link, with run-on connections, between the demand centres of Manchester and Leeds.